Walking around Maybee, Michigan on a little photo expedition, we happened across Barker's Trading Post and Auction. One of theÊProprietors notices us walking around outside checking out their buildings and invited us in to check out their auction barn. What a treasure! 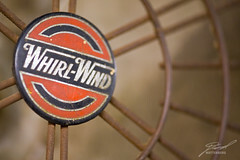 This Whirl-Wind fan was one of many in their barn which they're still using.